A university student has designed a smartwatch which detects falls for elderly people. 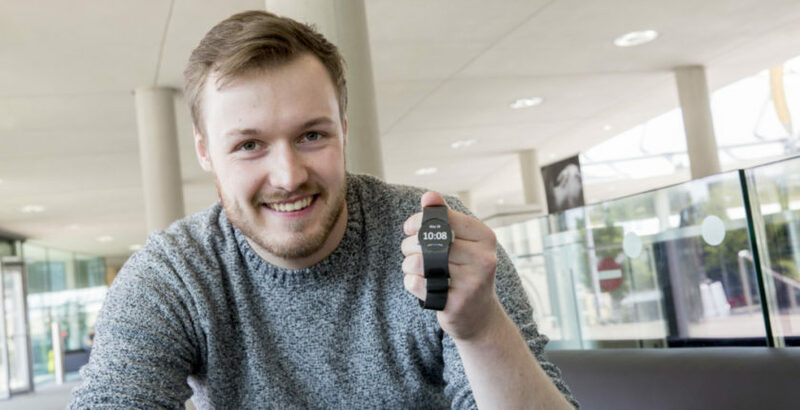 Matt Russell-Smith, a BA (Hons) Product Design student at Nottingham Trent University, has designed the watch to enable elderly people to get help faster after they have had a fall. Matt hopes his design – named Stopple Watch TM – will prevent elderly people experiencing the same trauma as his grandparents. “My grandpa once fell and was unable to move and he couldn’t call for help,” Matt said. The wrist watch works by tracking information such as a person’s pulse or movement. When it detects a change in a person’s health, the watch sends information to a touchscreen hub located in the home. The hub then alerts pre-determined contacts and calls for help immediately. During his research into fall detection devices, Matt said he discovered that existing products, such as emergency pendants, are often unattractive and uncomfortable, which can put people off wearing them. Matt designed his watch with style in mind, making it more appealing to wear but still simple to use. The watch is made from stainless steel, with a steel mesh strap and a magnetic buckle, to make it easier for people to put on and take off. Matt’s design is set to go on public display for Nottingham Trent University’s Art and Design Summer Show 2018.